Freidin Brown, P.A. 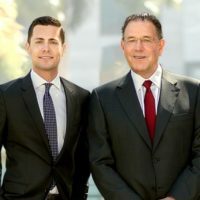 Lawyers Philip Freidin and Jonathan Freidin Obtain Groundbreaking $7 Million Result | Freidin Brown, P.A. Congratulations to Freidin Brown, P.A. lawyers Philip Freidin and Jonathan Freidin for obtaining a groundbreaking result for their client and the United States government in a whistleblower (qui tam) case, U.S. ex rel. Graves v. Plaza Medical Centers, Corp., et al., Case No. 10-23382-CIV-MORENO/O’SULLIVAN (S.D. Fla.). This was a non-intervened False Claims Act (“FCA”) case alleging Medicare fraud, overbilling, and upcoding by medical providers, as well as a failure of the Medicare servicing organization to have appropriate safeguards to protect against fraud. The case resulted in a $3,000,000 recovery for the United States and a hard-fought award of over $4,052,497 in lawyers’ fees and costs against the defendants. Freidin Brown, P.A., serving as Lead Counsel for the Plaintiff/Relator Dr. Olivia Graves, also negotiated a 29 share of the recovery for their client. The case was particularly complex and was fiercely defended by national and local counsel for Humana, Inc. and counsel for Plaza Medical Centers, Corp. (there were 960 docket entries). In addition, the issues in this case had never before been litigated and counsel’s actions and strategy created a blueprint for future False Claims Act cases. As U.S. Magistrate Judge Lauren Louis wrote in her Report and Recommendation, “Beyond the numbers, the Court also notes that Relator is a party who obtained relief of significant import in the FCA realm. Relator’s case is one of the first Medicare Part C cases to advance beyond summary judgment, and as such is likely to have lasting impact on the future of actions based upon fraud alleging Medicare Part C. Indeed, this case, and the order adopting the Report and Recommendation denying summary judgment, has already been cited in a False Claims Act Treatise. [citations omitted.] The Court recognizes the value this novel claim has brought to the United States beyond the monetary recovery, and the path paved for other claims to be redressed as a result of Relator’s efforts here.” (Emphases added). The case, filed under seal in 2010, was nearly as long as it was complex. After four years of investigation, the Government declined intervention, and in 2014 the case was unsealed. While many lawyers would withdraw when the Government decided not to intervene, Relator’s counsel passionately embarked on a mission to recover millions in Medicare overpayments on behalf of the United States—all on a contingency basis and paying litigation costs out of their own pockets. Counsel overcame multiple motions to dismiss and completely prevailed on three heavily litigated motions for summary judgment filed by defendants. On the eve of trial, the parties reached a settlement, which left it up to the court to award fees and costs, and counsel obtained settlement approval from the U.S. Department of Justice in November 2017. Counsel also prevailed in their motion for fees and costs, which was hotly contested by defendants. Following a Report from Magistrate Judge Louis, U.S. District Judge Federico Moreno entered a final order awarding over $4,052,497 in lawyers’ fees and costs to the Relator. This outcome was not only a great victory for the lawyers and their client, Dr. Graves, but it was also a great victory for the real party in interest—the United States.